Sue: She would take my chin in her fingers and tilt my head so I could read her lips and say, “Someday you’re gonna thank me for this!” And I thank God for her! A lot of our listeners will have heard of our guest because of the TV show, Sue Thomas: F.B. Eye. It’s based on Sue’s experience reading lips to help capture criminals. She really did do that! But we’re going to hear the real story, and you won’t want to miss this moving account of God’s grace overcoming many obstacles. Sue visited our studio to talk with Nancy, and during the interview—keep in mind—Sue Thomas is reading Nancy’s lips. Nancy DeMoss Wolgemuth: Sue, we are so grateful to have you here at Revive Our Hearts today. This is an honor to have you in the studio. Thank you for coming. Sue: It’s a joy and a privilege. Thank you. Nancy: You’re going to be speaking at a church in our community tonight, and I know those ladies are really looking forward to hearing you. Sue: I'm excited as far as the words that the Lord would give to me. I’ve been praying about what direction to go. I have no idea, but at that moment the Lord will take up, and I’ll just wait and see what we’re going to do! Nancy: Well, we’ve just had lunch together—you and your assistant, Deborah, and Robert and me. I wish we could have been recording that conversation, because it was so sweet. Nancy: And your heart, your love for Jesus, shines through in what you say and how you say it. I’m so thankful to meet you, too. Sue: Thank you, but there’s time. It’s an honor, Nancy. The people that listen to the radio have to realize that—being deaf—I don’t even know what radio is, let alone listen to it. I’ve never heard you on the radio, so I have no idea what type of program this is going to be. But we’re just going to let the Lord take off with it and lead with us. But I’m with family, I’m with the Lord, so I’m safe, and I’m very, very happy! Nancy: Well, our listeners are going to love hearing your story, because it’s a testimony of God’s amazing grace, and your love for Jesus is going to be very rich and special to our listeners. I’d love for you to share just how your parents first learned that you were deaf. You weren’t born deaf. How did you parents first learn that you had lost your hearing? Sue: I was eighteen months of age, and I was watching TV with my brothers. All of a sudden, I ran up and I turned up the volume knob full blast. My brothers turned it down, I turned it up, they turned it down. Mom and Dad came running into the room to find what all the racket was about. They thought that I was tired and cranky and it was time to put me to bed. That night, when they tucked me into bed, neither of them realized that it would be the very first long “silent night” of the rest of my life. The next morning when I awoke, my mom was talking to me . . . sounds were going off . . . she realized I was totally oblivious to my surroundings. And she grew concerned and called our neighbor who was a nurse. They have no understanding of why I lost the hearing that night. I wasn’t sick, I didn’t have any instrument or anything poke my ear. They don’t know. But, today with medical science and because I have multiple sclerosis, it’s very possible that way back then I had MS, because MS is known to cause deafness. But I won’t know until I stand before God and He reveals the mystery of my silence. Nancy: What you do know is that God has used that silence to reach many, many people with the gospel of Jesus Christ. Sue: Yes, but unfortunately, Nancy, I didn’t allow Him to do that in the beginning. For the first thirty-five years of my life, my deafness was my worst enemy. It was the thing that I despised and I hated the most. It was the pack of garbage on my back that I carried, that kept growing and growing. It would be my deafness that God would use to bring me to the foot of the cross. So basically, if you want to talk about the transformation of that cross—the before and the after—the thing that I once despised and I hated, with the transformation would be my best friend. The thing that I would learn is that the silence will teach us—if we listen. It’s only in the silence that we hear the true, still small voice of God. Nancy: Yes. And I want us to unfold that story of how you came to know God through the silence. But let’s go back to your childhood. How did your parents respond to the fact that their little eighteen-month-old daughter had lost her hearing? Sue: It was a tragic time for them. You see, I’m the youngest of three brothers. My next older brother was seven, the next ten and thirteen. They waited a long time for a little girl. They finally got her, and now they’re at the point where the doctors and educators alike are sharing that they should send me away. They said that I would never learn to speak, that I would have a hard time simply learning. They didn’t want to send me away after waiting for so long, and they took a vow that they would do everything possible—they’d give me every tool possible—to help me live and survive in the world of sound. Nancy: So how did they do that? How did they help you learn to survive in that world? Sue: The first thing was to develop my voice. I was basically babbling. At eighteen months, I did not have a clear voice, anyway. So we went and started with a speech therapist. And it was with the therapist that I sat in front of a very large mirror—like the windows that you have today. I sat in one chair and my therapist sat in the other, and I looked in the mirror. As she formed her mouth, I tried to form my mouth. I would put my hand on her throat to feel the vibrations. I would try to make those same vibes in my own throat, over and over. Nancy: So you were doing this as a little girl? Sue: I’m a little girl . . . and I’m not very patient! Basically, about every two minutes I would get up and try to run around the room, and be grabbed and go back to the mirror. I thank God those sessions were only a half-hour long. But they seemed like a lifetime to me! If I ever thought that that first half-hour session would last for over seven years . . .
At the end of the seven years of therapy, the therapist knew that there was still more work to be done, but she had given everything she had. They passed me over to a voice teacher. Now, I did not study opera! Basically, the voice teacher was to get my voice to fluctuate, up and down, up and down. At the end of the voice lessons came dramatic reading with poetry, for articulation and enunciation. Well, I can be at the airport, a restaurant, or hotel and somebody will always come up to me and say, “Where are you from? You really have an accent.” Well, I’ve been claimed by the Germans to be German. I’ve been claimed by the British to be British. The only ones that haven’t claimed me yet have been the Japanese and the Chinese! Maybe one of these days, the wind will blow the right way and I’ll sound like them. I don’t know . . . but it’s just different. But because it’s different, it’s my weakness that God has used to spread His strength and to make Him known. So way back then, I had all those therapy lessons. My parents never gave up. My father worked two and three jobs as a manual laborer in order to pay the bills to give me the gift, the equipment, to be what I am today with the voice. Nancy: And you have said that the Lord always sent the people that you needed to help you become the woman He wanted you to be. Sue: I will share this when I stand on the platform: my story is not just my story. It’s for every person that has walked along my side to encourage me, that gave their time to instill in me to be what I am today. And wherever I go, they go with me. Their legacy lives on within me! Sue: I do. This was the one thing that, growing up as a child, my parents instilled in me. God does not make a mistake! It was instilled in me; it was the anchor that kept me going. Unfortunately—my parents had the faith, we were church-goers on Sunday, we went to church, we came home—the Word of God was not read in our home. But where the Word of God wasn’t read, my parents were singers. Of the German heritage, of the Welsh heritage, everyday—always—would be spent in singing the hymns. So I learned the hymns but not the Word of God. But the faith was there. I was created in the image of God, and, basically, He doesn’t make mistakes. And if I would hand my hand to Jesus and allow Him to lead me and guide me, there wouldn’t be anything that I couldn’t do or become. Nancy: Now, that faith would be challenged in later years, but as a child your parents helped create some experiences that you could enjoy. And one of those was ice-skating. Sue: No, Nancy, it’s roller skating. Sue: No, it’s not your fault. The world knows me as an ice skater, because when they released the TV show, they made me into an ice skater. (laughter] Why? Because ice skating is more popular than roller skating. It’s another way that Hollywood kind of deceives. Nancy: And later, your story was made into a TV series—we’ll talk more about that later. I know that many of our listeners have watched that series, so they’ll be interested to know the real Sue Thomas. Nancy: But you learned to roller skate with music. How was that? Sue: Another life, another situation that God used. I couldn’t hear the music, and as a result, my coach—at the onset—skated hand-in-hand with me at the crack beat of that music, over and over and over. God used the rink to save me from total despair. In school, I was laughed at and ridiculed for talking funny. I was laughed at and ridiculed for being the dummy; for getting the questions, but never getting the answers. My grades were D’s and F’s. I was put in the slow learners’ class. After school, when I went to the rink and I laced up those skates, I took off as fast as I could! The world couldn’t touch me. I did the jumps. I went to the heights. The world couldn’t touch me. And because of the help of this one man, my coach, he gave me the beat of the music. He stood on the edge of the rink waving his hands as a signal to take off—the music’s on! He made me into the youngest Ohio State Champion Skater. No one had a bigger trophy in my school than I did. It gave me my life-saving device. There’s many, many different ways that God will bring help into our lives to help us endure the pain or the despair. For this particular situation, it was a pair of roller skates. Nancy: And your parents also gave you a love for music. Nancy: You wouldn’t think of a deaf woman having a love for music, but you did. Sue: This was the one thing that people could not understand—nor myself! My parents, as I said, loved music—Welsh and German. They sang the hymns. At the age of five, my mom wanted me to learn the piano. Dad brought in the piano, then my mom sat at my side, placed my hands on the keyboard. And at first, for this little kid it was so interesting to feel the vibrations . . . different vibrations all over where I played. But as a kid, the novelty wore off. I would get up early, even, when I was five, to play football with my brothers. And my mom would get me and drag me back to the piano! And I thank God for her, because as the years went by, I started to study classical piano. I wanted to major that in college, but I couldn’t do so because I couldn’t take the ear training courses. But it would be the classical music that would fill my emotions and my void. I was able to express myself in a way. So, Nancy, when my family got together and the friends came over and I couldn’t read everybody’s lips, I would leave the party and I would go to my piano. I would be with my “friend,” and I would be okay. Nancy: Tell us more about what is was like for you being in public school. You weren’t in a special class; you were with hearing children. What was that experience like for you? Sue: I started out as a normal child in the public school. The teacher knew I was deaf. She put me in the front row so I’d be able to read her lips as best as I could. And back then, I didn’t read lips too good. But I tried to follow the class. Whatever they would do, I would do. Opening session was when we were asked to introduce ourselves to our classmates. I followed everybody, and it came my turn. I remember getting up and standing beside my desk and looking very proudly at my classmates. I just released my name in such a garbled, horrifying way, where the entire class just erupted in laughter! I remember turning around to try to figure why everybody was laughing so hard, and when I couldn’t figure it out, I just sat down. But I came to realize that every time I was to open my mouth to speak, the entire class would erupt in laughter. I got to the point where I wouldn’t open my mouth. Nancy: Do you remember how old you were then? Sue: Oh, sure. I was probably in the first and second grade, so I’m at six and seven years of age. It didn’t matter, because I had three older brothers at home. What these guys didn’t realize is that I had three older brothers with whom I used to get in some good tumbling matches! So when they least expected it in the middle of the playground, I did the only thing that I could possibly do. I punched them out; I knocked 'em flat! Then I was sent to the principal’s office. I was being disciplined and explained to that little girls did not punch little boys out. But this was my defense mechanism. I was a fighter at this point. I remember going to school, sitting in front of the front row, watching my teacher ask all sorts of questions like, “What’s the state capital to Ohio?” Then I’d wait for the answer, never realizing that some smart kid behind me had waved his hand and gave the answer. Nancy: But you couldn’t hear it. Sue: As a result, I got all the questions—most of them—but I never got the answer. My grades became D’s and F’s. I remember my teacher coming up to me at my desk. She looked awful sad that day. She reached down and she took my hand in hers and led me out of the classroom. That day we walked down the hallway (it seemed like an awful long walk), and I entered another class. I was entered into the “dummy class” with the mentally retarded. I remember those years, sitting in those classes, total silence—of not knowing really what was going on—never opening my mouth once. God was with me. It was with the skating rink, and it was with the music. Let me go back to the music for just a spot, because as a wee little kid, my mom put me on her lap. As she sat in the rocking chair, as she sat rocking back and forth, she sang all of her favorite hymns. With my head on her shoulder, I could feel the vibration. My hand would sort of creep up on her throat so that I could get all the vibes that I possibly could. It must have been around Christmas, because one of the first songs my mom ever taught me was "Silent Night." The words didn’t mean anything to me. It was the rhythm and the flow of that song that brought forth tremendous peace. I can remember going to the principal’s office and getting that spanking. I would go back to my classroom, sit at my desk, look out the window, and bite the lower part of my lip so I wouldn’t start crying. And way down deep I would start singing "Silent Night" to myself, and I’d be okay. Or after a long, lousy day of school, going home on the school bus, sitting so close to the window that—when I looked out—my nose would be all squished up against the glass so nobody would see the tears coming down my face, I’d be singing "Silent Night," and I’d make it home. If my parents were alive today, they’d tell you that every single night—June, July, August, September—they would hear me sing "Silent Night" to put myself to sleep. It was my anthem. It still is. The skating rink, the music . . . God was with me in all those circumstances. How much I would have totally wiped out in the world of silence without Him! Nancy: Would you be willing to sing "Silent Night" for us? Sue: You ready for this? Sue: Okay. I don’t sing for you, and I don’t sing for anybody, but I always sing for Him. Nancy: And that song is about the Lord Jesus, Who came to this earth as a baby to give us life. And when we come back on the next program, we’re going to hear how you came to have that life in Jesus Christ. Sue: You’re a lover of music . . . you play piano . . .
Sue: You’ve never heard that sung in B flat and E minor at the same time! Nancy: But I think that’s my favorite time I’ve ever heard it! Leslie: That’s Nancy DeMoss Wolgemuth. She’s been speaking with Sue Thomas, who’s been reading Nancy’s lips this whole program. She couldn’t hear Nancy’s voice at all. 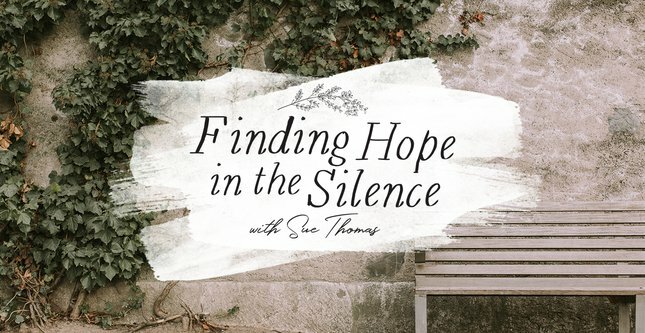 The story Sue is telling us this week reminds us how painful life can be in a fallen world. But the story also reminds us of an important truth: God is big enough to handle any tough circumstance. He loves us enough to walk through everything with us. Sometimes when you’re facing your own pain, you need to be reminded of the truth. We’d like to help you by sending you the 2018 Revive Our Hearts wall calendar. The theme this year is, The Truth That Sets Us Free. Each month, you’ll read a quote from Nancy’s book Lies Women Believe and the Truth That Sets Them Free. The new revised version will come out in February, but you can get the calendar now. It’s our way of saying "thanks" when you give a gift to support the ministry of Revive Our Hearts. Ask for The Truth That Sets Us Free wall calendar when you call with your donation. Here’s the number: 1–800–569–5959, or you can donate online and get the wall calendar. That address is ReviveOurHearts.com.